Today I'm gonna talk about a new skincare discovery. I have dry to combination skin but during winter my skin becomes particularly dehydrated and that's when facial oils become my best friends. Although I've been using facial oils for nearly 2 years now, I had never heard of Marula Oil before. 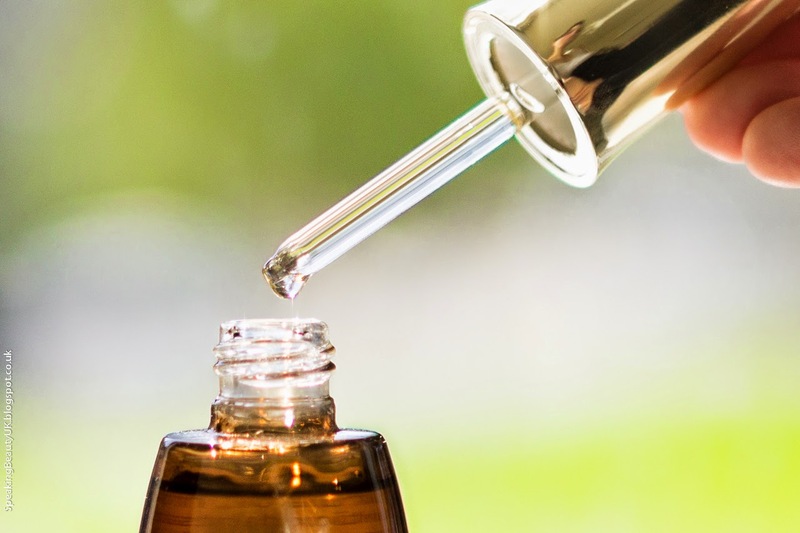 However, when I was offered to test The Leakey Collection Pure Marula Facial Oil* by John Paul Selects, I did some research on it and was instantly intrigued and excited to see the results I'd achieve with this wonder product, that has been featured in many articles from popular magazines such as Cosmopolitan (read here). This oil is beautifully packaged. I love the glass bottle with golden lid / pipette. It's so pretty and elegant. Looks really expensive, much more than high end oils I've tried before. You get quite a lot of product (30ml) and the best part is it's all very natural: 99% marula oil and 1% essential oil fragrance blend (linalool, limonene). The scent is very faint but pleasant. I'm sure even those who don't like scents at all in their skincare will be happy with how the oil smells. 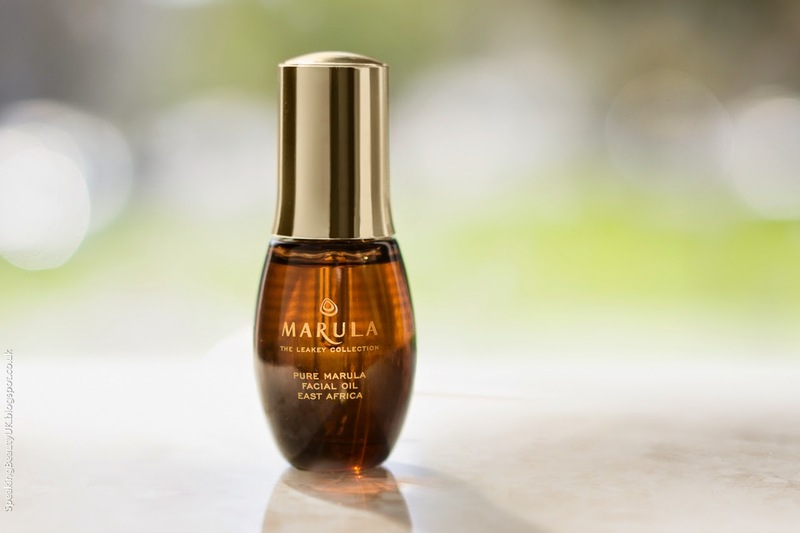 For those who don't know, Marula oil is an all natural, light textured oil extracted from wild harvested Marula kernels (nuts) from Marula trees, which are located in East Africa. This anti aging oil is suitable for all skin types and promises to hydrate, protect and rejuvenate the skin. Researches reveal the oil is rich in antioxidants, nutrients, minerals, vitamin E and fatty acids that protect against environmental aggressors, reverse photo damage, boost cellular activity, hydrates and repairs the skin. The fruit contains 4 times as much vitamin C as an orange. Sounds lovely, right?! And it is. I have been using this oil every day, morning and evening and my skin has been feeling soft, much more hydrated and overall really healthy. I mix in 2-3 drops of the oil with my moisturiser in the morning and apply it underneath my makeup. I noticed my foundation glides on really smoothly and stays glowy and hydrated all day, without looking oily. I know a lot of people prefer oil free makeup but this is a natural oil and the results I've achieved with it so far are all great. It hasn't broken me out at all. In fact, I was told that this oil is great for soothing spots and the skin in general, after treatments and sunburn. So fear not! At night, I apply a little bit more, around 5-6 drops to my face and neck, after cleansing and toning and I wake up with plumped skin. The only thing I don't love, but unfortunately it's something I've noticed with every other oil I've tried, is that when applied on its own, the oil doesn't sink in 100%. It seems to leave a very thin layer of product on the surface, that I can feel to the touch but the good news is it doesn't feel tacky at all. Plus it doesn't leave residue on my pillow, which is also good. The instructions also recommend applying it to the hands as an anti aging moisturiser or add 2-3 drops to cleansers, masks or scrubs to boost efficacy but I have only used it as a facial moisturiser and I'm really enjoying it. So if you suffer with dry patches, dull and dehydration skin in general, I'd highly recommend giving the The Leakey Collection Pure Marula Facial Oil a try. It's such a facial treat! Plus it's easily accessible, as you can buy it from any Holland and Barrett store in the UK (£37.50) and Sephora in the US ($78). *Disclaimer: This product was sent to me for review. All comments are my own and honest opinion.